There’s a Chinese proverb that says “failure is the mother of success”. The point is exactly what you think it says – there’s always a chance to learn from every failure you experience, and from it find success. It is even more imperative for leaders of any stripe to be able to learn from failure. 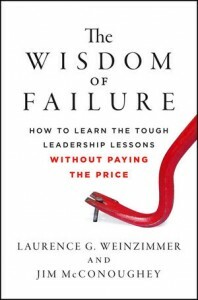 This is the premise of the book “The Wisdom of Failure: How to Learn the Tough Leadership Lessons Without Paying the Price“, authored by Laurence G. Weinzimmer and Jim McConoughey. The book is based on a ground-breaking seven-year study that covers almost 1,000 managers across 21 industries about what they really think about learning from failures. It dissects the kinds of leadership, both good and bad, that can be found in different company cultures and distils the essence of what can be learned from those leadership behaviors. These leadership styles – with real-life examples that will make the subjects squirm if they get to read this – will look very familiar to us. There’s the leader who’s obsessed by performance reviews, the perfectionist, the ones who aren’t equipped to deal with drama (bullying at the workplace, dysfunctional teams), the disengaged leader, the one’s who’s utterly self-absorbed or driven by irrational greed (chasing pennies with dollars). You’ll find yourself nodding a lot as you read through the book – especially when you have someone in mind when a certain leadership style is described – but more importantly, finding the right nuggets of dealing with such leaders. The best parts of “The Wisdom of Failure” come in the exclusive interviews with CEOs – from big companies to small businesses – where they candidly share about where and why they’ve gone wrong. It’s all very revealing, and if you’re a leader of an organization you may spot some of the symptoms they describe within your very own organization. It’s all very well and good to say wisdom is learning from failure; I think it’s far more wise to learn from the mistakes of others so you don’t repeat them in your own experience. If you think this way too, you should pick up a copy of “The Wisdom of Failure“.